Anne Lyden is taking part in Courage on the Catwalk this year, after battling acute myeloid leukemia. But when the incessant caller tried again, the 72-year-old knew something was wrong and answered. It was a doctor at Aberdeen Royal Infirmary who insisted she head straight in the next morning, bringing with her an overnight bag. “That overnight bag should have been a trunk, because I was in there for four months,” Ms Lyden said. “I hadn’t been feeling myself for quite a while, so my daughter told me to go the doctor who took some bloods. “I was lying in my bed at midnight that same day and the phone rang. “I thought to myself ‘nobody phones me this late, it must be a wrong number’ so I let it ring off. But then it rang again. Once at hospital, doctors told the grandmother-of-four that she had acute myleoid leukaemia (AML), a rare and aggressive cancer that attacks red blood cells, platelets and certain white blood cells. She was invited to take part in a clinical trial, involving intensive chemotherapy sessions, and decided it was the chance she needed to beat the disease to enjoy more time with her family. Ms Lyden described her treatment at the Anchor Unit as “first class” but admitted it had been hard to be away from her home in Aberdeen for so long. She said: “The trial was based on very intensive chemotherapy. The first cycle was 22 chemo sessions in 10 days. “That hit me very badly and nobody knew if I was going to make it through. “The second and third cycles were far less intensive and I always say that after the first one, they were a doddle. “It was hard being in hospital for so long, but my family and friends were amazing. Ms Lyden paid tribute to the staff in the Anchor unit at ARI and said the team from charity Friends of Anchor had helped keep her spirits up. “I feel like I had first-class treatment, as I was being monitored and cared for 24/7,” she said. “I don’t know how young men and women cope with getting chemo and then going home to their families and getting the kids to school. I really admire them so much. It’s hard to lead a normal life at home after chemo. Now in remission, Ms Lyden is determined to give back to Friends of Anchor and is preparing to take part in Courage at the Catwalk at the Beach Ballroom next month. 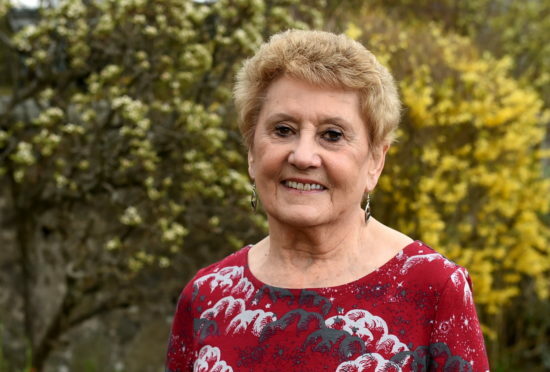 She and the other 23 women taking part will be cheered on by daughter Jenny, who lives in Ellon, and son Martin, who lives in Amsterdam, as well as her grandchildren and friends. The event will help gather vital funds for the charity’s new Anchored Together appeal, which aims to raise £2 million for the Anchor Centre, scheduled to open in 2021. Ms Lyden’s daughter put her forward for the fashion show in secret, but as part of her post-cancer mantra, she is embracing the experience. “Life has changed,” she said. “I’m much more appreciative and I don’t sweat the small things. “When I was in hospital I had lots of time to read the leaflets and my daughter and I picked up the Friends of Anchor material, so read about Courage there. “Unbeknown to me, Jenny made the decision that if I got through the treatment, she was going to put me forward. She put in the application and then told me afterwards. “I decided to go along with it and I’m delighted that I did. “I’m really enjoying the rehearsals and meeting friends who have come through the different cancers and the young women coming through it with young families. Courage on the Catwalk takes place at the Beach Ballroom in Aberdeen on May 11 and 12.